During my time in Cape Town, I connected with Acacia Africa. The overland tour company provided me a half day tour of the city highlighted by a visit to the District 6 museum. Afterwards, they took me by the office and allowed me to see operations and listen to the stories of past adventure. Africa continued to amaze. I know my travels to Africa only scratched the surface. The five weeks spent last year definitely not enough. 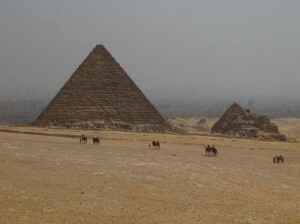 And when approached about a guest post, I said yes and asked about Egypt. It is a place I wanted to see, and still do. Is it ready? I hear yes it is, I know I am. While Southern Africa’s main attraction is undoubtedly wildlife, for the northern region, culture and history are the most compelling reasons to visit. In Egypt, the first stop is almost always Cairo: home to the Great Pyramid of Giza, the last surviving member of the ancient Seven Wonders of the World. Of course, appreciating day-to-day life in the capital is also a huge draw card, and before heading off to marvel at the country’s architectural treasures it’s worth beating a path through downtown Cairo. A thick aroma of herbs and spices make downtown a real feast for the senses, and the narrow market lanes are atmospheric, the numerous traders hoping to haggle with you over their wares. Once you reach the pyramids you can leave the bartering behind you and just take in your surroundings. This is a task that comes effortlessly when you’re gazing at Giza’s Great Pyramid, every one of the two million stones weighing almost three tons. Of all the imposing structures it is undoubtedly the most breathtaking, but it’s not simply due to its astounding size. The engineering feat behind its creation has mystified archeologists for centuries, the sheer precision of craftsmanship challenging the architecture of our very own modern day skyscrapers. The Philae Temple at Aswan is another historical site worth paying a visit – not just because of the spellbinding scenes depicted on its walls, but also because of the effort it took to reclaim the building. It once stood on an island of the same name, but was submerged under water from 1906 until 1980, the entire temple moved stone by stone to Egilica Island, where a new dam was built. Not wanting to quell it’s architectural claim to fame, this is a country with a broader array of treasures. And, if you really want to travel back in time, your best bet is to break it up en route and set sail in a traditional felucca. After you’ve packed your bags in the hold, watch rural life drift by and glide down the Nile just like the ancient Egyptians. 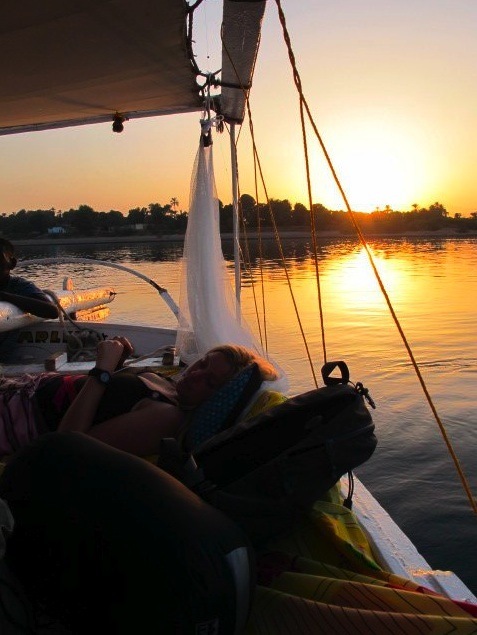 The trip is a real eye opener when it comes to living like a local, and it’s the perfect opportunity to recharge your batteries before soaking up all that Luxor has to offer. The piece de resistance – sleeping on the deck under the stars! When you arrive in Luxor there’s another helping of bygone Egypt, but the Karnak Temple is one of the city’s more impressive sights. An endless number of kings and queens were immortalized here including, Ramses II, a megalomaniac who had more edifices and statues commissioned after himself than any other pharaoh in history. Mixing it up in Egypt is certainly not a problem and with an endless number of inviting resorts surrounding the Red Sea it would be a shame to curtail any holiday and not dive Dahab. 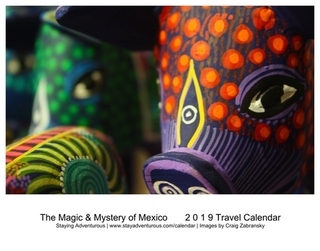 This is the ideal way to go after you’ve checked off your must see list of ancient architecture, and scuba virgins need not worry as there are plenty of opportunities to learn. The once hippy enclave still has an edge and if you combine that with the welcoming nature of the Egyptian people, it’s a dose of R&R that’s incredibly hard to refuse. Viv has worked as a tour leader on Trans-Africa tours, and to date has completed three Sahara crossings. He visits Africa once or twice a year and has a particular soft spot for Kenya, Tanzania and Uganda, because, he says, “these places are less simply less predictable, and that’s part of the joy of traveling.” The author can be reached by email and you can find Acacia-Africa online. 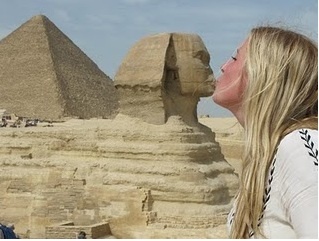 Homework assignment for Craig…….get yourself to Egypt so we can hear your own perspectives on that historic region. OK – maybe we’ll give you a homework extension until things settle down a bit more.